The Philipses in Surry and Isle of Wight probably descend from one Thomas Philips, born 1599, who came to Virginia in the "William and Thomas" in 1618 and who was living at Basse's Choice at the time of the muster in Feb. 1625. His wife Elizabeth, born 1602, came to the colony in the "Sea Flower" in 1621. (17th Cent. p. 88). Thomas Philips was granted 300 acres of land in James City County July 9, 1635, on the south side of the Chickahominy River, 150 acres for the personal adventure of himself, Elizabeth his wife and Elizabeth his daughter. (Nugent-p.26). On May 29, 1638 Peleg Buck was granted 500 acres in James City near land lately in the tenure of Thos. Philips. (Ibid: 83). One Elizabeth Philips made a deposition in Surry in 1672 giving her age as 72. (Col.Surry, p.216). Thus, she could have been the wife of Thomas Philips, above, who was born in 1602. The Chickahominy River is located on the north side of the James River northwest of Williamsburg VA. There is an island there formerly known as "Phillips Island" based on another land patent record around this time. In 1723 a Thomas Phillips, with two "L"s, received a land grant for 85 acres on the north side of the Battle land. Available on microfilm. Virginia State Land Office. Patents 1-42, reels 1-41. 85 acres lying on the head of Battles land. Adjoins land of Benjamin Harrison and Thomas Battles. Land Office Patents No. 7, 1679-1689 (v.1 & 2 p.1-719), p. 296 (Reel 7). 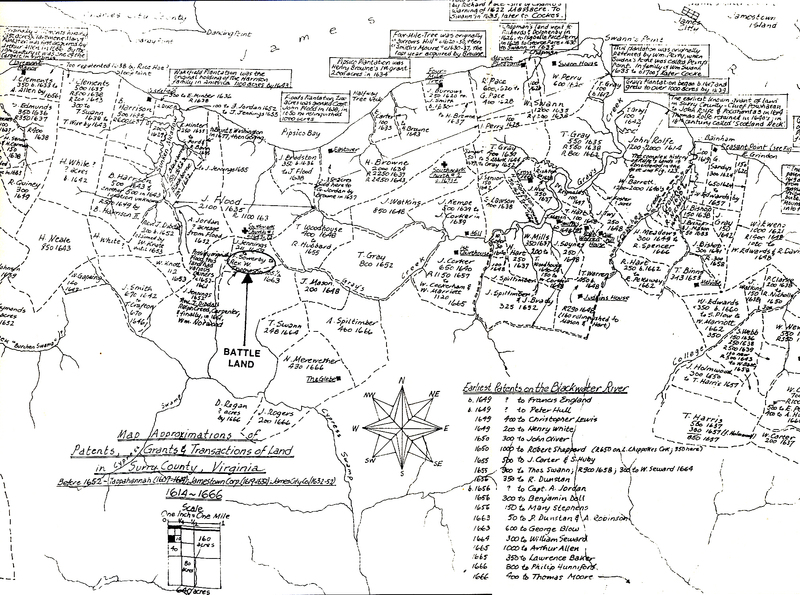 Below is a map showing approximations of Patents, Grants, and Transactions of land in Surry County VA before 1652. Click on the map to open a larger view in a new window.